Help raise money for the Challenged Athletes Foundation. As a company built by athletes for athletes, being active is part of our DNA - it’s who we are and what we do. We believe everybody deserves the opportunity to live an active lifestyle, so we’ve partnered with the Challenged Athletes Foundation (CAF) and GU Energy to help athletes with physical challenges get the same access to sport that we have every day. For this Challenge, we’re asking you to run as much as you can in three weeks. The more kilometers we run as a collective community, the bigger impact we can make towards this cause. The money raised will go towards costly adaptive sports equipment like running prosthetics and hand cycles (that are not covered under insurance), to give challenged athletes the opportunity to pursue active lifestyles just like the rest of us. Take on this Challenge as a reminder to appreciate the impact that being active has on your daily life. With every stride you take, you’ll increase our ability to make a difference in the lives of athletes in need. Run 50 kilometers or more during the Challenge and you will unlock the ability to purchase a limited edition tee for $35. 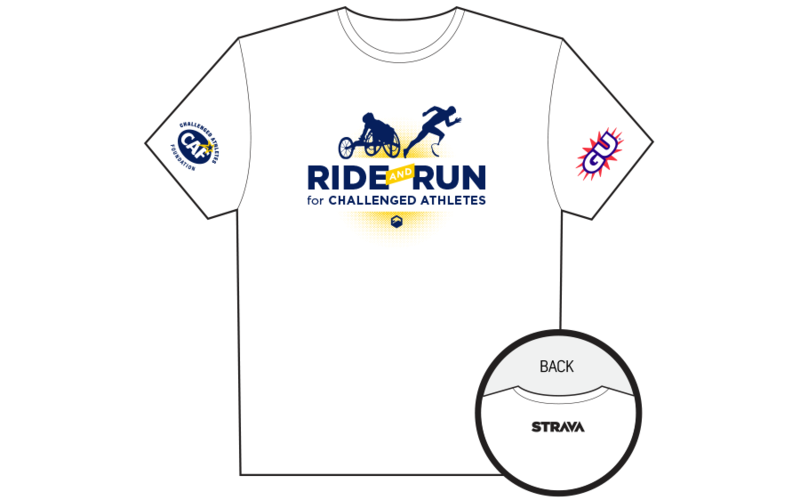 Strava will donate 100% of profits for all tees sold to the Challenged Athletes Foundation. The purchasing window will close 3 days after the Challenge ends. The expected delivery time is 4-5 weeks for domestic orders and 6-7 weeks for international. 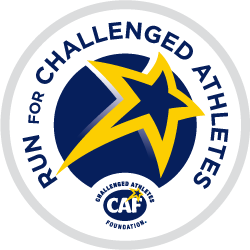 For each kilometer run during the Challenge period, GU Energy will donate $0.01 to the Challenged Athletes Foundation. In addition, athletes that run at least 50 kilometers will also earn a badge in their trophy case. There is a Ride for Challenged Athletes option if you want to contribute your cycling activities as well. GU Energy will donate up to $50,000 based on the total number of kilometers run (and ridden) during the Challenge period. The contribution will be $0.01 for each kilometer run and $0.01 for each three kilometers ridden. You can also donate directly to the Challenged Athletes Foundation by visiting their website. Strava (“Sponsor”) is pleased to introduce the Run for Challenged Athletes (the “Skill Challenge”) made available at www.strava.com (the “Site”). As a condition of participating in the Skill Challenge, entrant (“You” or “Your”) agrees to be fully and unconditionally bound by these Official Rules and the decisions of Strava, whose decisions shall be final and binding in all respects, and to waive any right to claim ambiguity in the Skill Challenge or these Official Rules. You may enter the Skill Challenge by going to the Site on or before October 26th, 2014, clicking on the corresponding Skill Challenge URL that will direct You to the Skill Challenge landing page, where You will be entered into the Skill Challenge by clicking on the Join button. Starting from the day the Skill Challenge begins on October 6th, 2014, you have until October 26th, 2014 to run 50 kilometers. Each activity (Run) must be logged on the Site and cannot be inputted manually. For more information regarding how to log activities on the Site, please see Strava’s How It Works page (http://www.strava.com/how-it-works). If You successfully log 50 kilometers between October 6th, 2014 and October 26th, 2014, You will be a prize winner, subject to Sponsor’s verification. Any form of entry and participation in the Skill Challenge other than that described herein is void. Each prize winner will win a digital badge in their trophy case (Approximate Retail Value ("ARV"): $0. Total ARV of all prizes: $0. In addition, for every kilometer successfully logged as part of a run during the Challenge, GU Energy will donate $0.01 towards the Challenged Athletes Foundation. Maximum combined donation across both the Ride for Challenged Athletes & Run for Challenged Athletes Challenges is $50,000. Sponsor will announce the potential winners of the Skill Challenge within one (1) week after the conclusion of the Skill Challenge on October 26th, 2014. All potential winners will be notified via the email address associated with the potential winner’s account and will be posted on Sponsor’s Site (http://www.strava.com/challenges/run-for-challenged-athletes). Prizes will be deemed to have been won when all conditions in these Official Rules and accompanying Terms (http://app.strava.com/terms) are met. You have not yet won a prize. The actual odds of winning any prize will depend upon an entrant’s ability to complete the Skill Challenge. Skill Challenge ends on October 26th, 2014. See Official Rules above for entry requirements and complete prize restrictions. Sponsored by Strava,500 3rd Street, Suite #110, San Francisco, CA 94107.